OTTAWA -- Canada's border-security minister says there is a backlog in the screening of asylum seekers, including those who are considered irregular border-crossers walking into the country from the United States, but it doesn't constitute a security problem. Internal government documents obtained by lawyer Richard Kurland under the federal access-to-information law show that as of Feb. 28, 2018, there were 11,745 asylum-seekers waiting for second security screenings, up from 1,683 just two years earlier -- an increase of about 700 per cent. Overall, 41 per cent of the backlog cases were refugee claimants "who are already in Canada but who have not been security screened," Canada Border Services Agency officials wrote in a presentation outlining why things were so backed up, and who was stuck in it. The Toronto Star first reported the details, which lit a political fire in the House of Commons' daily question period. 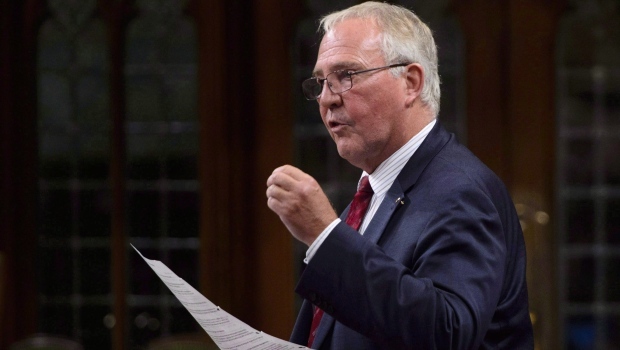 Border Security Minister Bill Blair said officials check all asylum-seekers at the border and stressed "there is no security threat to Canadians." He said there is a backlog for the second checks, but didn't say how many people are in it now. "As part of the process of determining their eligibility for asylum ... there is an additional screening that takes place," Blair said. "We are working hard to deal with the backlog that they left to us," he said, referring to the previous Conservative government, "and we will complete that process before anyone is eligible for refugee status in our country." The answer didn't sit well with Conservative immigration critic Michelle Rempel, who questioned how Blair can say there are no security threats if the people involved had yet to go through the full screening process. "One could argue that it would be difficult to evaluate if someone posed a security risk to Canada if their security screening was not completed," Rempel said. Everyone who comes across the border is screened upon arrival and given a biometric scan to check against data held by some of Canada's allies, such as the United States, to see if the person has any flags on his or her file. Kurland said it's problematic that the security screening process continues after people have entered Canada. Pointing to the documents, Kurland noted some claimants who don't raise immediate alarms can have "extensive criminal history for theft." That's the sort of thing the initial check isn't designed to detect. "These people wait in security backlog in larger numbers and for longer periods of time. Why?" said Kurland, a lawyer with the firm Kurland, Tobe. "We know there are bad people. Do we save money by letting more bad people spend even longer periods of time in our streets because we have a growing backlog of security cases, or do we spend the money now to reduce the security backlog?"